Here are my predictions for the men's quarterfinals at the Australian Open for 2019. I will also predict the women's quarterfinals. Novak Djokovic (SRB)  vs Kei Nishikori (JPN) . Nishikori has had an incredibly rough path to get to his 3rd consecutive major quarterfinal (and tenth overall). Three of the four rounds at this year's Australian Open have been 5-set matches and two of those have been decided by a final set 10-point super tiebreaker where Kei has been substantially behind but ended up getting to 10 points first. Since Djokovic has won the last two majors (2018 Wimbledon d. Kevin Anderson and 2018 U.S. Open d. Juan Martin del Potro) and is a 6-time winner in Melbourne he is widely viewed as the prohibitive favorite to win the 2019 Australian Open. However, he has not been winning as convincingly as one would expect from the World's #1, dropping a set in each of his matches against #NextGen opponents Denis Shapovalov and Daniil Medvedev. That being said, Djokovic has an overwhelming 15-2 head-to-head advantage against his quarterfinal opponent and must be considered a favorite to reach his 7th Australian Open final. Mad Professah's pick: Djokovic. Sascha Zverev (GER)  Milos Raonic (CAN)  vs Borna Coric (CRO)  Lucas Pouille (FRA) . Lucas Pouille had never won a match at the Australian Open before this year despite playing it every year since 2014. Now, with Amelie Mauresmo as his coach he has won four in a row, taking out another #NextGen member in Borna Coric to reach his first major quarterfinal in three years (and the 3rd in his career). His opponent will not be the World #4 but instead will be the resurgent Milos Raonic who is trying to return to the top of men's tennis after an injury that took him out of contention for most of 2018. Sascha Zverev has been one of the surprising disappointments in the men's game despite winning the biggest title of his career (the 2018 ATP Tour Championships) by defeating Novak Djokovic and Roger Federer along the way. Zverev won only two games in the first two sets before demolishing his racket and the third set was a tight affair but Raonic won the tiebreaker and the match. Interestingly, Raonic is 3-0 against Pouille, including a win on grass last year so he should go into this match-up with a lot of confidence, and the experience of playing in his 9th career quarterfinal (3-5 record). Mad Professah's pick: Raonic. Marin Cilic (CRO)  Roberto Bautista Agut (ESP)  vs Roger Federer (SUI)  Stefanos Tsitsipas (GRE) . Roberto Bautista Agut (or RBA as everyone calls him) has yet to lose a match in 2019, and is playing some of the best tennis of his life. He has an incredibly difficult draw, but has made it this far. Some of the scalps he has collected in Melbourne include Sir Andrew Murray's, 2018 Australian Open finalist Marin Cilic, and the highest ranked #NextGen player Karen Khachanov. 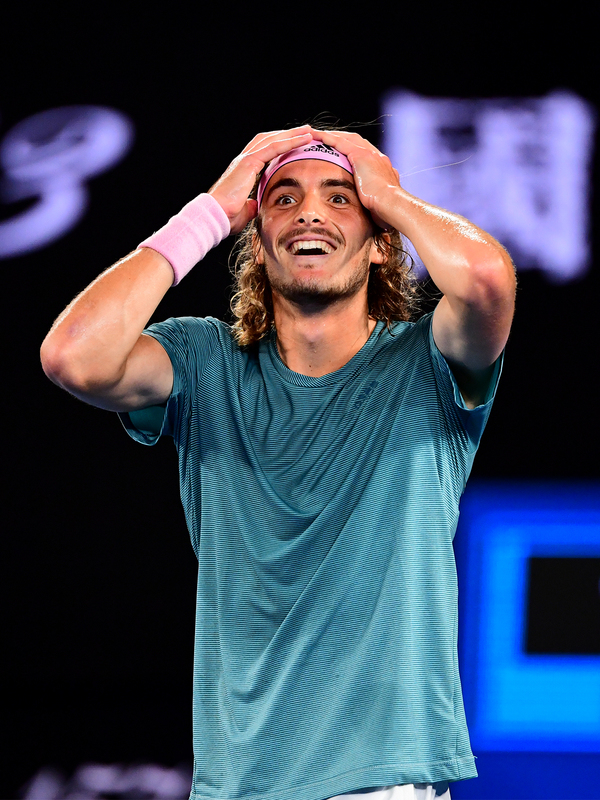 However, he may have met his match in the brilliant Stefanos Tsitsipas who took out Roger Federer, the 2017 and 2018 champion, in four scintillating sets. The 20-year-old Greek has a big game and the maturity of some years his senior so I would not expect a mental let down despite the task of building on his paradigm-shifting win. Mad Professah's pick: Tsistipas. Rafael Nadal (ESP)  vs Francis Tiafoe (USA). No one really has expected Nadal to do well here because his record in hard court tournaments is so hit or miss. However, it should not be forgotten that he has won the US Open three times (2010, 2013, 2017) and the Australian Open once (2009) and reached the final here three other times (2012, 2014 and 2017). But the Spaniard has yet to drop a set in four rounds of play, which bodes well for his ability to go late in the tournament. His opponent will be 21-year-old Francis Tiafoe playing in his very first major qurtaerfinal, and the first time he has been the last American remaining in a grand slam draw. Tiafoe has already taken out two very good hard court players in Kevin Anderson and Grigor Dimitrov but there's nothing that prepares one for the tenacity and power of Nadal. Surprisingly, the two have never played before and that might give Tiafoe a chance to make some inroads, but I would be surprised if he wins a set. Mad Professah's pick: Nadal.